Regular dentist visits do more than keep your smile shining – they can also tell dentists a lot about your overall health, including whether or not you may be at risk for chronic disease. Dental visits are an investment in your overall good health. But if you don’t have a dentist, or are waiting to find a new one, your dental and general health can be at risk. Which is why it is important for you and your family to find and have a great dentist. If you are looking for a great dentist near Glenroy, the Glenroy Dental Group is happy to give you the following advice, confident that you will end up with us! How convenient is the dental office’s location? What kind of technology is used in the treatment? Is information provided about all fees and payment plans before treatment is scheduled? What kind of emergency services are offered? Does the dentist honor your dental health plan? Is the dentist comfortable dealing with dental anxieties? How do they handle nervous patients? 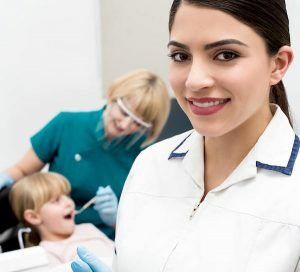 What is the dentist’s education and training? Do they keep up to date with latest techniques and modern dental practices? If you are looking for a new dentist, a good place to start is to ask friends, family, and other health professionals – speak with your pharmacist or doctor. However, don’t use recommendations as your only source of information–you may not like the same things in a dentist as they do – it is only one piece of the puzzle. Check online to make sure a dentist has all the services and skills you require. Much of your preliminary search can take place on Google, Yelp, or similar search/information tools. Once you have narrowed down your search, go on a visit. You can talk to a dentist to learn about their procedures, practices and policies. Also chat with the office staff and assistants to learn about their training and education, term of practice, specialities, appointment schedules, emergency care, office hours, payment plans and staff experience. The more information you have, the better! Don’t overlook convenience! No matter how skilled a dentist is, if you don’t see them, they can’t help! Check hours, access, parking, and services. You should choose a dentist that it is easy to visit. After all, you will be visiting at least twice a year and don’t need excuses not to visit! Give your choice a test run. The final step in finding a good dentist is to have them treat you. If you have a bad experience at one dentist’s office, there is no reason you should have to go back. You are in charge! At The Glenroy Dental Group, convenience and care are built in to everything we do. Operating in Glenroy for more than 20 years, we are a community and family based practice offering full range of general dentistry services including cosmetic enhancements, preventative care, treatment of bad breath, children dentistry and emergency care. Glenroy Dental Group is conveniently located in the Pascoe Vale Road shopping strip, Glenroy, with ample parking space and within easy walking distance of the Glenroy train station. In addition, we offer interest free payment plans – fortnightly or monthly payments, on treatments above $1000, over max term of 3 years. We prefer minimum payment of $100/month. Find more about amazing our offers for new and existing patients. Visit our special offers page today.